Ahmadiyya, a group, founded in the 19th century India, has suffered fierce persecution in various parts of the Muslim world where governments have declared them to be non-Muslims. Despite opposition from mainstream Muslims, the movement continued its proselytising efforts and currently boasts millions of followers worldwide. Based on the documentary sources and other scholarly writings, this paper judges the claims made by the movement's founder, Mirza Ghulam Ahmad, analyses the consequences of the claims and examines their proselytizing strategies. 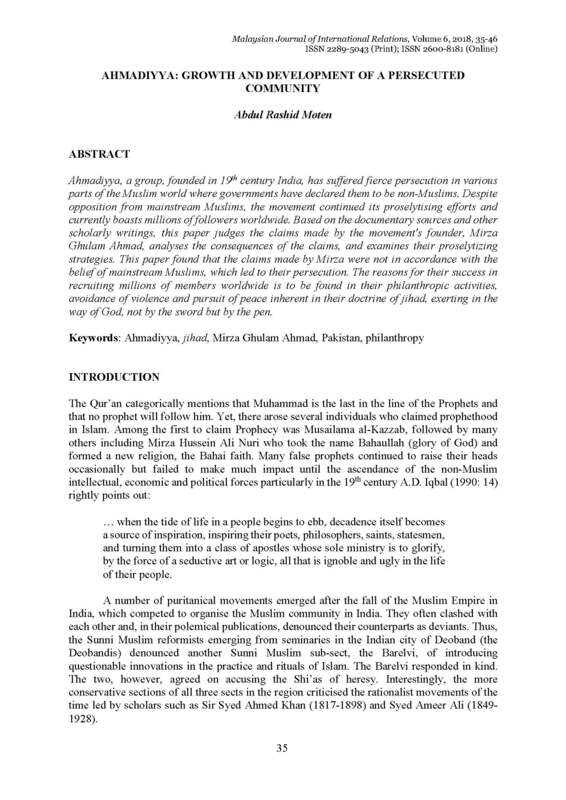 This paper found that the claims made by Mirza were not in accordance with the belief of mainstream Muslims, which led to their persecution. The reasons for their success in recruiting millions of members worldwide is to be found in their philanthropic activities, avoidance of violence and pursuit of peace inherent in their doctrine of jihad, exerting in the way of God, not by the sword but by the pen. MOTEN, Abdul Rashid. Ahmadiyya: Growth and Development of a Persecuted Community. MJIR | Malaysian Journal of International Relations, [S.l. ], v. 6, p. 35-46, dec. 2018. ISSN 2600-8181. Available at: <https://mjir.um.edu.my/article/view/12881>. Date accessed: 26 apr. 2019. doi: https://doi.org/10.22452/mjir.vol6no1.4.